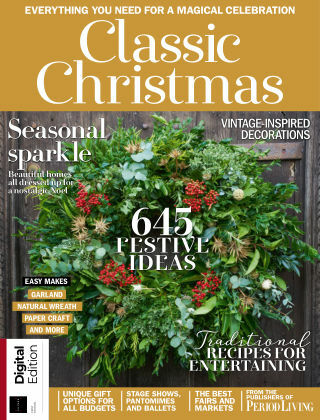 With Readly you can read Period Living Classic Christmas and thousands of other magazines on your tablet and smartphone. Get access to all with just one subscription. New releases and back issues – all included. Period Living Classic Christmas is your essential seasonal collection of ideas and products. Filled with beautiful period homes to inspire your own festive looks and household traditions, along with the latest decorations, craft projects, recipes and unique gift guides, this book contains everything you need for the perfect nostalgic celebration. In addition, you will discover the best days out in the UK and beyond, from winter markets and festivals, to wonderful stage shows and pantomimes that are guaranteed to get you in the mood for the big day. To help you get organised during the build-up to 25 December, the book also includes a handy Yuletide countdown, to ensure you won’t forget anything to make Christmas 2018 the best yet.